Being able to pick and choose between premium Windows phones has been a long time coming. In September, Acer took the wraps off what it then called the “Jade Primo,” revealing the new “PC phone” at a press conference at the IFA show in Berlin. At the time, Acer executives wouldn’t say whether or not the phone would ship to the United States—and it still won’t. According to Acer, the Liquid Jade Primo will cost 569 euro ($618) when it begins shipping to Europe and the Middle East in February. It “will be gradually rolled out to other regions,” Acer added, without specifying what those regions will actually be. 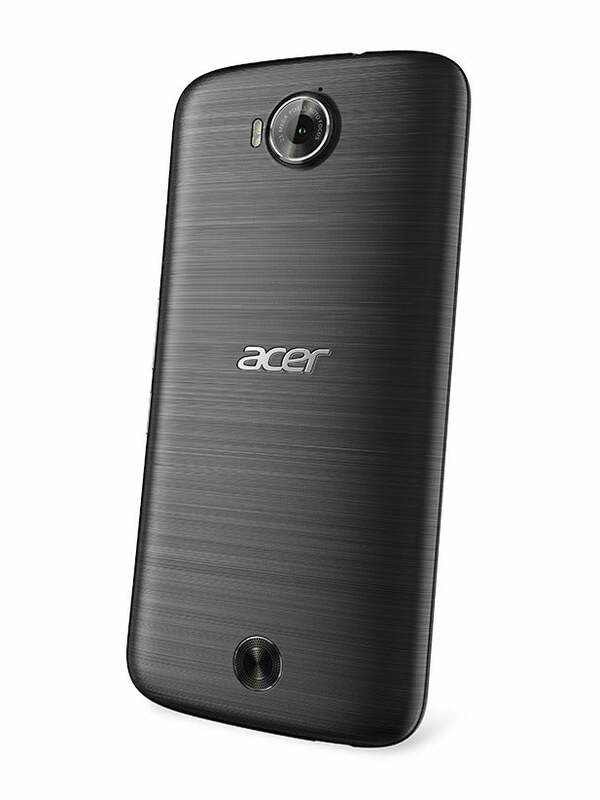 Acer also indicated that the price of the phone would vary by region. The back of the Acer Liquid Jade Primo. Acer said in September that the phone would include a 5.5-inch super AMOLED display on the front, alongside a pair of impressive cameras: 21 megapixels, with dual flashes on the back; with a front-facing 8MP camera as well. Inside, Acer said then, will be a Qualcomm Snapdragon 808 chip. Acer now adds that the Liquid Jade Primo will include 3 GB of RAM as well as 32 GB of internal storage, and that the display is “Full HD,” or 1080p, and backed by a 2.5D Corning Gorilla Glass screen. (Acer didn’t mention an SD card option or removeable battery.) The phone will connect via LTE Category 6 as well as 802.11ac MIMO Wi-Fi. The rear-facing f/2.2 camera will be capable of 4K video recording, while the front-facing f/2.2 wide angle camera can record up to 1080p. That display size puts the Liquid Jade Primo squarely in the middle of Microsoft’s own flagships, the $549 5.2-inch Lumia 950 and the $649 5.7-inch Lumia 950XL. 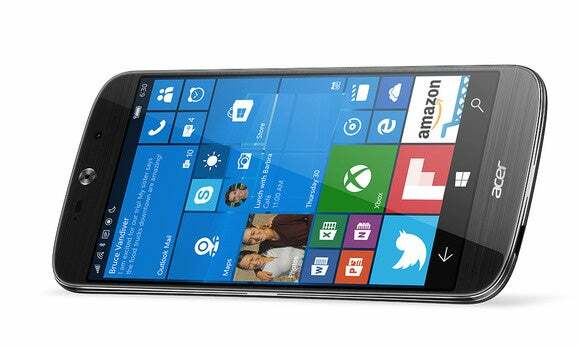 Like the Liquid Jade Primo, the Lumia 950 includes a Qualcomm Snapdragon 808, while the the XL uses a Snapdragon 810. Both of Microsoft’s phones, however, boast a 2,560 x 1,440 (quad HD) display. Acer also made clear that the new phone will work with the Display Dock that allows Microsoft’s two new Lumia phones to be connected to an external display and resize their output accordingly, also known as Continuum. They will be charged and connect to the Display Dock via a USB-C connector. Besides the Windows Hello capability built into Microsoft’s Lumia phones, the latest Windows Phone hardware hasn’t proven to be much of an issue, with the Lumia 950. Microsoft’s Windows 10 Mobile operating system and apps, however, included several bugs at launch, which Microsoft has been busy fixing with software patches and with a new firmware update for the Lumia 950 and Lumia 950XL that began rolling out overseas just before Christmas. It remains to be seen how the Liquid Jade Primo will measure up in that department. The fact that third-party companies continue to support Windows Phone, however, should be an obvious relief for Microsoft. HTC shipped a Windows Phone version of the M8 in 2014, a program that was supposed to usher in a wave of Android phones offering Windows variants. That didn’t happen. Overseas buyers continue to support Windows Phone more than domestic buyers, however, which explains why Acer is launching its new phone in EMEA first. In the U.K., for example, Windows Phone's market share was about 7.6 percent in the first quarter of 2015 according to Canalys, while WP’s share languishes under 3 percent in the United States, comScore reports. For Acer, overseas Windows Phone customers will get priority.